Château de la Chèvre d’Or is closed for the winter season, but continues to inspire! Starting December 5th, 2016, Château de la Chèvre d’Or is launching the Instagram Photo Contest #chevredorjadore! If you want to participate – nothing is easier! Subscribe to our Instagram account @lachevredor, if you haven’t already. 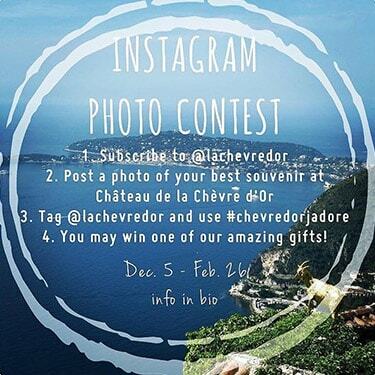 Post a picture of your best souvenir from your stay or dining experience at Château de la Chèvre d’Or and make sure to tag us @lachevredor and to use the hashtag #chevredorjadore (please make your profile public during the entire contest period). It can be your lunch or dinner in one of our 4 restaurants, during your breakfast or a relaxing time by the pool, at the terrace with a cocktail or simply a photo of our stunning view over Cap Ferrat and the Mediterranean. Surprise us! Every week, the best picture will be published on our Instagram page, and will be one of the 12 finalists that will compete and try to win an amazing 2 nights stay in one of our Junior Suites and an unforgettable gourmet experience! The 12 pictures of the week will be published on our Facebook account on February 27th, 2017. The photo that will collect in total the most “likes” and “love” on Facebook and Instagram during the week from Febraury 27th, 2017 to March 5th, 2017 will win an amazing weekend for 2 persons, and another 2 invitations for lunch at our gourmet restaurant will be offered to the 2nd and 3rd places (please see conditions and description here-below). So don’t wait any longer, take your smartphones and participate at our most exciting winter contest!